London, UK: May 15, 2013 -- Vertex Standard continues its commitment to developing land mobile radios (LMR) that are precision-engineered for more value with the introduction of its new eVerge™ digital two-way radio series. 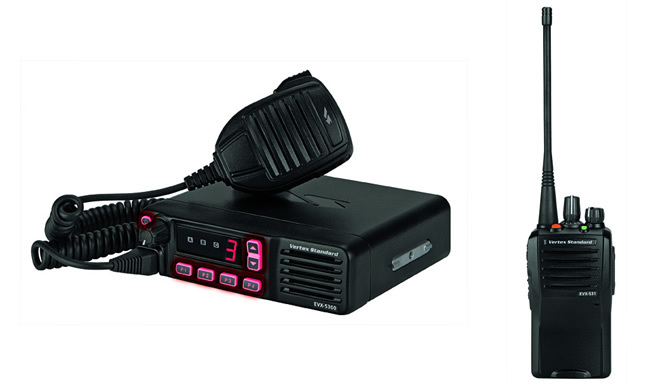 The new eVerge™ digital radio portfolio includes the EVX-530 series portable radios; EVX-5300/5400 series mobile radios and EVX-R70 repeater for a complete digital system. These new radios are designed to work with existing analogue radios for easy conversion from analogue to digital for added convenience. eVerge™ radios are ideally suited for commercial and industrial customers who currently use basic 2-way radio for voice communications and could benefit from better audio quality, better coverage and more privacy without incurring higher equipment costs. eVerge™ radios support easy, efficient conversion from analogue to digital. The ability to operate in both digital and analogue modes enables users to migrate to digital at their own pace to best support their functional and financial needs. They are also designed to help customers use the right digital protocol, TDMA (Time Division Multiple Access), for optimum power and spectrum efficiency. TDMA is compliant with the DMR (Digital Mobile Radio) Tier 2 standard so eVerge™ digital radios are compatible with more than 74% of digital radios used worldwide. TDMA also maximizes user performance with double the call capacity in one frequency channel to support two simultaneous digital conversations without relicensing or rebanding. Better call quality versus analogue. Ultra clear digital signals cut out static and interference and preserve voice quality over a greater range. eVerge™ radios also feature AMBE+2™ vocoder technology to further improve voice quality in noisy environments. Enhanced privacy when operating in digital mode without the need for extra encryption hardware. Only the intended recipient(s) hears what is transmitted without the risk of impacting voice quality that can be experienced with analogue encryption. EVX-530 series key features include up to 40% longer battery life operating in digital mode and IP 57 fresh water submersible for 1 meter up to 30 minutes. Plus the entire eVerge™ series provides a complete suite of safety alert capabilities: one-touch emergency, lone worker and Vertex Standard exclusive ARTS. Established in 1956 with headquarters in Tokyo, Japan, Vertex Standard LMR, Inc. is a global manufacturer of two-way radio communications equipment. Known for compact, feature-rich radios built for maximum value, Vertex Standard remains exclusively focused on developing two-way radios to meet customer needs worldwide by innovating value without sacrificing quality to connect without compromise. The radios are sold and serviced throughout EMEA through a network of dealerships.